Breakfast at the hotel. Today you will be taken for a walk back in time. We will visit one of the most romantic and well preserved colonial towns of Colombia, Villa de Leyva. A beautiful town with white houses and streets paved in stones, but not without paying a visit first to the Underground Salt Cathedral, built 180 meters below the surface in Zipaquira. The Salt capital of Colombia. Typical Lunch. Accommodation. Breakfast at the hotel. Departure to Barichara as scheduled. 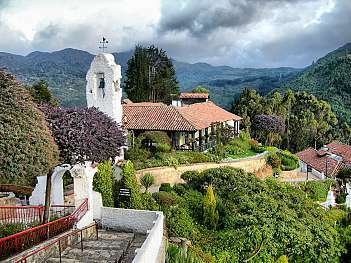 Located in the department of Santander, this town is considered one of the most beautiful villages of Colombia along with Villa de Leyva for its colonial architecture. Typical Lunch Accommodation. Breakfast at the hotel. In the morning, we will go to the Chicamocha Canyon, an attraction with spectacular landscapes and an aerial tramway that crosses along the canyon. Not advised for the non-adventurous. Once on the other side of the Canyon, we will then visit a coffee Hacienda at Mesa de los Santos. An ideal place to enjoy exquisite Colombian coffee, relax with friends and family or practicing a variety of outdoor activities. Return to Bucaramanga. Typical Lunch Accommodation. Breakfast at the hotel In your first day in Cartagena de Indias you will be taken for a tour around the modern neighborhoods of Bocagrande and Manga, where you will be able to see the contrast between modern architecture and the beauty of the old houses from the twentieth century. Further ahead, up at the Cerro de la Popa, you will have the opportunity to appreciate the heart of Cartagena as well as the whole city. 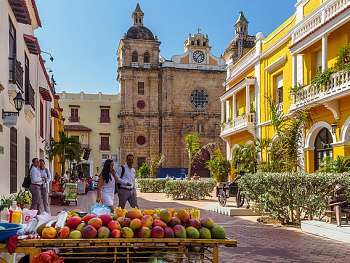 The historic center of Cartagena was declared Heritage of the Humanity by UNESCO in 1984. From here, we will go visit the Castle where the Spaniards sought to protect the city from the attacks of the English in the seventeenth century, “el Castillo de San Felipe de Barajas”. 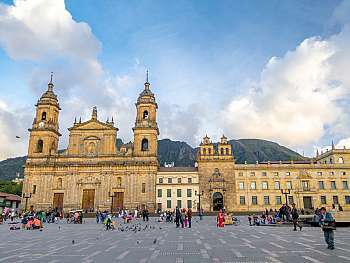 We will finish the tour with a stroll through the narrow streets of the wall city for you to contemplate the charm of its colonial architecture. Accommodation. Breakfast at the hotel. Pick-up and transfer to the airport as scheduled.